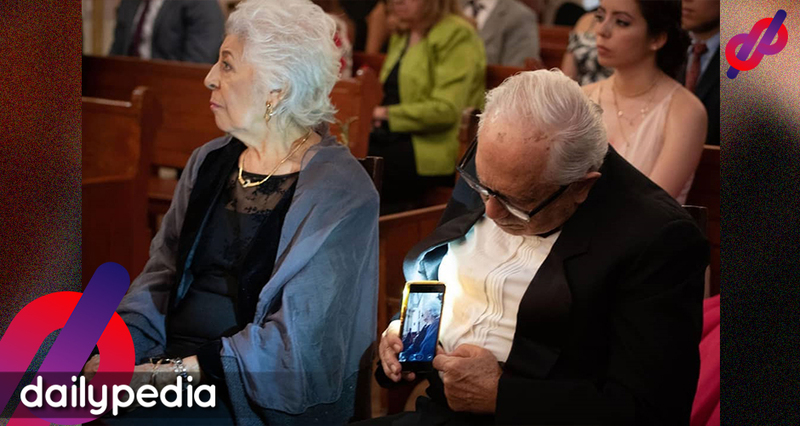 Edmundo Cambron, a photographer covering a wedding event, was curious as to why an old man was leaning forward while holding his cell phone. Then he realized that the old man was actually stealing/taking a photo of his wife on his device. He immediately captured the sweet moment and shared it on a social media with a caption that read, “Yesterday I shared this photo, which had very good response, and I want to tell you that thanks to these two people, many couples remembered what love is, and now they become symbols of love,” which inspired netizens. The guy stealing a photo of her lovely wife is Emilio Sanchez at their granddaughter’s wedding in Mexico. He has been married to his wife Teresa Regla for 55 long years. What makes it so special is that Emilio is already 80 years of age but acts like a teenage who is so in love with his girl. The photo instantly became viral on Instagram and made the netizens wished to have found someone who would love them as much as Emilio show his love for his wife. The elderly couple is a testimony that real love exist, it is never a measure of time and beauty in true love. Instead it only needs two people staying faithful towards each other and willing to stay together. As Valentine’s Day is fast approaching and a lot of people are surely showing their sweetest gestures to the ones they love. Some brought flowers and chocolates while others would bring their love ones on a dinner date for two. But what really matters in a relationship is to show your love every time to the one you love, not only during special occasions. And for the ones who are still waiting for the right person to come, calling it as “Destiny,” patience is all you need. To Emilio and Teresa, we can say that they are destined for each other, for they were able to keep their relationship strong as the years went by.